Nissan commits to full passenger lineup of electric powered vehicles by 2022. New Nissan LEAF to be launched in 2nd quarter of 2019. Registration of interest now open for the new Nissan LEAF. Nissan Serena e-POWER to be launched in the 2nd half of 2019. First e-POWER model to be introduced in Asia & Oceania. Singapore, 10 January 2019 - Nissan today marks another milestone innovation at the Singapore Motorshow 2019 with the new Nissan LEAF and an exclusive preview of the new Nissan Serena e-POWER, the first e-POWER model to be introduced in the Asia and Oceania region. It marks the company's commitment to having a full lineup of electric powered passenger vehicles in Singapore by 2022. This is a step forward in Nissan's mid-term business plan, Nissan M.O.V.E to 2022, which aims to make innovation available and accessible to more customers in the region. Among the targets, Nissan aims to sell 1 million electrified vehicles - either pure electric models (EVs) or those with e-POWER powertrains - annually across the entire model lineup. "The Asia and Oceania region is primed for electrification. We are seeing an increasing need for sustainability, along with growing support from various governments in the region for the development of EV infrastructure. Singapore leads the charge as one of the first nations to electrify, in terms of both vendors and infrastructure," said Mr Yutaka Sanada, Regional Senior Vice President, Nissan Motor Asia & Oceania. "We look forward to building the future of mobility in Singapore and around the region, offering technology for everyone and moving towards a more sustainable world." The second-generation new Nissan LEAF embodies the core of Nissan's approach to innovation, Nissan Intelligent Mobility. It offers a smarter, safer and more sustainable driving experience through advanced technologies, including e-Pedal, an Intelligent Driving technology that allows drivers to manage up to 90% of their driving with just one pedal. This integrates acceleration and braking into the accelerator pedal, presenting a revolutionised driving experience with more enjoyment and less fatigue. Aligned with Nissan's vision on the future of mobility, the Nissan LEAF is built from the ground up on a 100% electric platform with a focus on safety and performance. As a result, the new Nissan LEAF's augmented lithium-ion battery pack remains unchanged in size, but now provides even greater capacity and durability, enabling more than 300km of driving distance on a single charge. Along with this extended range, increased torque (320Nm) and power output deliver an exhilarating drive. The exterior form and function have also been elevated in the new Nissan LEAF. The vehicle is framed by an athletic and sleek exterior while boasting the largest interior cargo space in its class. The Nissan LEAF is expected to launch in Singapore in the second quarter of 2019, and attendees of the Singapore Motorshow 2019 will be able to register their interest in the Nissan LEAF starting today. Also making an appearance at the Singapore Motorshow 2019 is the new Nissan Serena e-POWER, showcasing the remarkable driving performance of Nissan's electrified powertrain fitted into its well-loved Multi-Purpose Vehicle (MPV). As the first e-POWER model to be introduced in Singapore, the Serena e-POWER marks a milestone in Nissan's electrification strategy and is poised to be a game changer in the market, delivering convenience and versatility with exceptional fuel economy while transporting people, pets or large items. The Serena e-POWER offers great handling and a comfortable and reliable electric drive, without the need to repeatedly charge the vehicle. Embodying Nissan's Intelligent Power technology, the Serena e-POWER is outfitted with a unique battery-run-e-POWER electric motor system that drives the vehicle. A small gasoline engine charges the small, high-output battery when required, delivering impressive fuel economy, better acceleration and a quieter and greener driving experience. The Nissan Serena e-POWER will officially launch in Singapore in the second half of this year. "The introduction of new models and technologies, such as the new Nissan LEAF and Nissan Serena e-POWER, illustrated Nissan's unwavering commitment to innovation and sustainable driving," said Mr Glenn Tan, Deputy Chairman and Managing Director, Tan Chong International Limited." 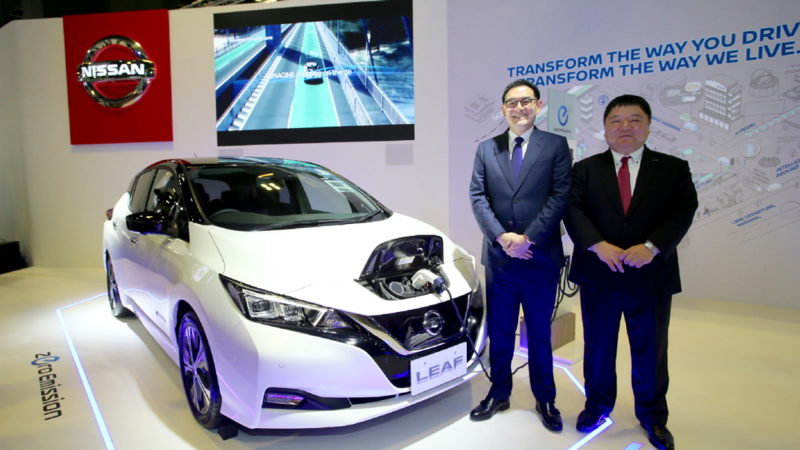 "By bringing the excitement and innovation of electrified vehicles to the country, Nissan aims to empower Singaporeans to transform the way they drive and transform the way they live. The Singapore Motorshow 2019 takes place from 10 to 13 January at the Suntec Singapore Convention & Exhibition Centre, across levels three and four.